Destination Dogs is a gourmet hot dog restaurant in Philadelphia, PA that originates from New Brunswick, NJ. Living in Philadelphia, Destination Dogs became a regular spot for me. I loved the food and became a regular at the bar where I learned that they were looking for a designer to take their guest experience to next level. Awesome. 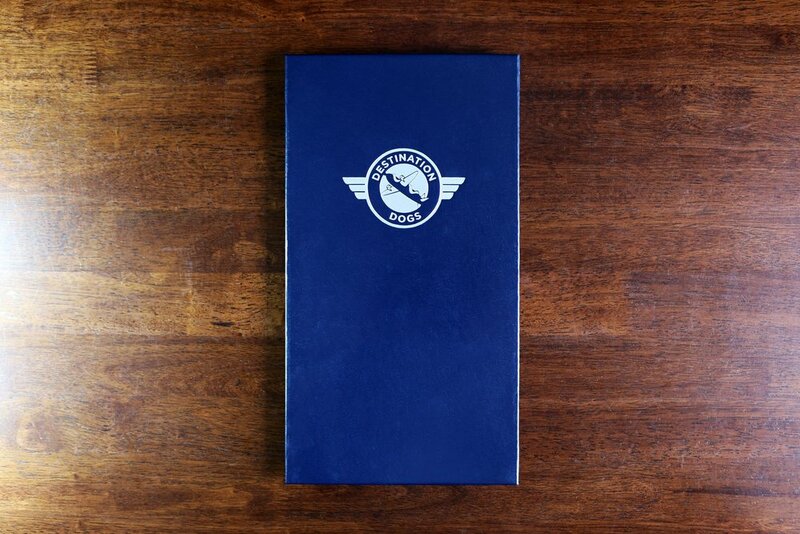 The client wanted the menus to embody the restaurant's theme. This gave me the idea of modeling the printed materials off of travel documents, something which everyone can connect to. Destination Dogs is all about locations around the world, so I tied each menu item to its' respective location. Frequenting the restaurant often, I quickly learned what the expectations were surrounding the restaurant's theme and also the menu items. The client wanted to menu to have a clean and tidy appearance and for it to have a logical flow, something the original menus did not have. Currently entering the final phase before being implemented, the food menu is the main attraction.